Originally a qualified teacher, Mrs Dorcas Olayemi (Yemi) Amusan-Fagborun (BA Hons Peace Studies; MA Women’s Studies) is currently the CEO of Peacemaker International, a registered charity in England and Wales, operating in Bradford, Manchester and Nigeria, advancing conflict resolution through mediation, racial harmony, equality and diversity training and services. The organisation empowers women and children for justice and supports families, people with learning disabilities and the elderly. It also provides mediation and conflict resolution to the community. She co-pastors Peacemaker International Assembly (an evangelical ministry) with her husband. 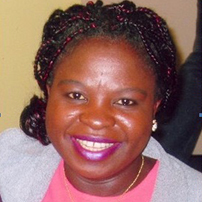 Yemi started her career in women’s empowerment and gender equality with MA in Women’s Studies when she researched ‘Effects of Polygamy on Women and Children. Having finished her First degree from the University of Bradford, she went to Platter College, Oxford to learn‘practical mediation’- where theories are put into practice.Today, she is a qualified mediator. She left all these places with remarkable commendations. In May 2009, she was awarded Community Involvement Award 2009 at the African Achievers Awards UK and in 2012 she was awarded two other community outstanding awards. Mrs Amusan-Fagborun is a passionate national/international campaigner on female genital mutilation (FGM) and very keen about gender violence, including Domestic Violence, Forced Marriages, Honour-related Killings, Child Marriage, Child Trafficking etc. Sheuses her life experiences to educate people about harmful effects of FGM and why the practice should stop. For more than two years, she has been coordinating in Bradford a community-led multi-agency group, bringing togetherpublic, community and voluntary sectors and professionals to provide an integrated way of working to support and increase the safety of women and girls who have been affected by or are at risk of FGM. Her new approach to eradicating FGM includes engaging politicians, children and young people, talking to school teachers both in Bradford and Nigeria. The approach has started to bear fruits as you will hear in her presentation.